The transition countries approach EU enlargement with GDP growth outperforming the 'old' EU. In 2003, Poland's economy resumed quite strong growth after two years of stagnation. Growth accelerated also in the Czech Republic, while it experienced some moderate slowdown in Romania, Bulgaria, Croatia, Hungary, Slovenia and Slovakia. A definite growth slowdown was only recorded in Serbia and Montenegro. Russia and Ukraine performed very well, registering significant and balanced growth. The prolonged near-stagnation in the EU has had limited impacts on GDP growth in the transition (and even the accession) countries. The levels of synchronization of their business cycles with that of the EU are not yet very high. Continuing structural and institutional adaptations, as well as ongoing gains in labour productivity remain important for maintaining export competitiveness. 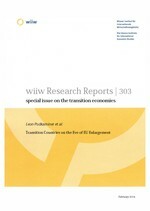 In 2003 the task of enhancing competitiveness benefited from the strengthening of the euro vs. the US dollar, which happened to coincide with the real depreciation of some accession countries' currencies vs. the euro. Apart from the beneficial cost developments, which are vital for the competitiveness of price-elastic (and essentially low value-added) products, the much more essential structural changes in the composition of exports have certainly continued. For Russia, external conditions were favourable in 2003: steep rises in the world-market commodity prices translated into a substantial growth acceleration, which spilled over into Ukraine. Growth in the five CEE acceding countries will speed up in 2004, but this is not related to accession itself. The impacts of the latter, both positive and negative, are likely to surface only in 2005. The combined effects of those impacts cannot yet be reliably quantified. Russia's and Ukraine's GDP growth is likely to slow down, though remaining quite high. Moderate and fairly stable growth is also expected in other transition countries not yet acceding to the EU. However, those countries will also be running very high current account deficits. This is rather unlikely to have significantly negative effects on growth in 2004. Such effects may appear later on (possibly already in 2005).